Attention ab flab, your days are numbered! That's what it says on the packaging for mamo mio's newest line of products to erase your problem areas...yes, your flabby tummy! 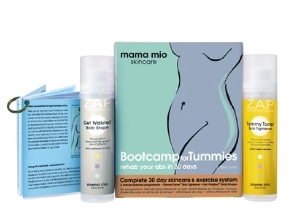 Bootcamp for Tummies is the perfect combination of skincare and exercise. If you commit for 30 days, just 4 minutes a day, you will see results. In 30 days your tummy will be tighter, flatter, smoother and more defined. Your posture will be improved, your back stronger, your skin softer – more toned, firmer and touchable. Lather your area and do a few Tupler Technique exercises and you are there! Booklet enclosed! A 4 minute tummy-tucking exercise program and Tummy Toner - Skin Tightener.